The efficient choice for water-cooled chillers above 60 tons is a variable speed centrifugal chiller. ASHRAE Standard 90.1 Building Energy Code requires such chillers to have a minimum efficiency between 0.577 – 0.634 kW/ton efficiency with an average part-load efficiency (IPLV) of 0.54 - 0.78. That’s not bad, compared to the part-load efficiency of a fixed speed centrifugal compressor or a screw compressor which average approximately 18% less efficient. 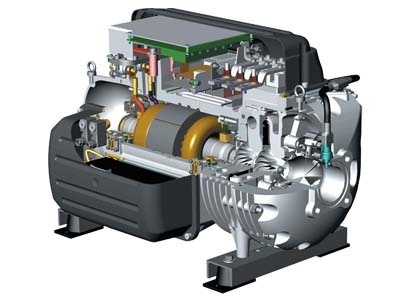 Magnetic-bearing centrifugal chillers use a permanent magnet synchronous compressor motor. 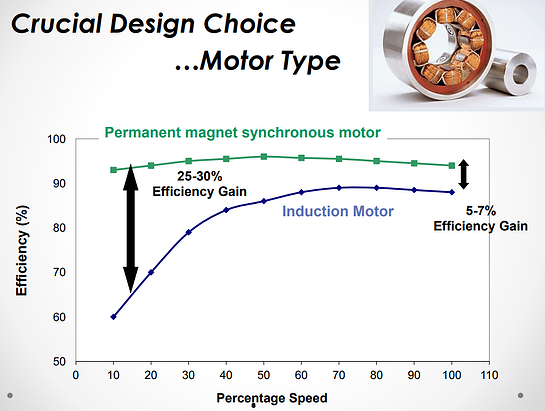 Such a motor has a significant efficiency increase over an induction motor, especially at low motor speeds, as shown in the figure above. Instead of physical bearings, magnetic levitation makes for a virtual frictionless operation. The motor also does not require oil lubrication; oil in the chiller evaporator creates a decrease in efficiency over time as the tubes foul, lessening heat transfer. In addition, the motor has an extremely low inrush current at start-up and the regenerative power system keeps bearings powered until the shaft stops spinning, which enables it to ride through short durations of power loss. Another attribute is that the lack of oil negates the downtime and maintenance costs of lubrication. The Navy Technology Validation Program ("Techval") conducted three magnetic bearing chiller retrofits as a demonstration project between 2005 and 2007. These installations resulted in 40-65% power savings over the original equipment, lowered start-up power draw, and reduced maintenance costs over traditional positive-displacement water-cooled chillers. They also concluded the new motors made the chillers operate much quieter. Within the following five years, the U.S. Navy has installed over 100 such units. The US General Services Administration (GSA) conducted an assessment of magnetic bearing technology in 2012 in a federal building in Arkansas for the same purpose of testing emerging technologies. This test provided an energy savings of 42.3% over positive-displacement water-cooled chillers and they concluded this was a cost-effective investment for a new or end-of-life chiller, but stopped from recommending it as a retrofit due to it high replacement cost. In our commissioning experience with the JCI/York YMC2 machine, we calculated the efficiency of the new chiller was 0.15kW/ton as compared to the original 0.57 and 0.78 kW/ton chillers. We also found its response time to load variation to be very smooth and the operation to be very quiet. There is another technology for oil-free chillers, which is refrigerant lubricated ceramic ball bearings. In our experience, we have opted for the magnetic bearing technology because it lives up to its efficiency and low-maintenance claims and its technology is simpler than the refrigerant lubricated system. Bottom-line is that magnetic bearing chillers have been around for decades outside of the U.S. and for more than 10 years within the U.S. They have proven their reliability so that the industry is now embracing these systems. Commissioning is also showing that their savings claims are living up to this good reputation.